Whether you live in a small or large space, clutter seems to slowly creep into people's lives. Cupboards, bathrooms, dressers and closets seem to be the biggest culprits of the clutter bug; and eventually, the mess forces a person to deal with the stuff. Trying to get a handle on the clutter can become frustrating and even overwhelming. Rather than letting the clutter become a way of life, learning how to organize each space and clean up the clutter is the better solution. Getting organized doesn't have to be costly or take a lot of time. 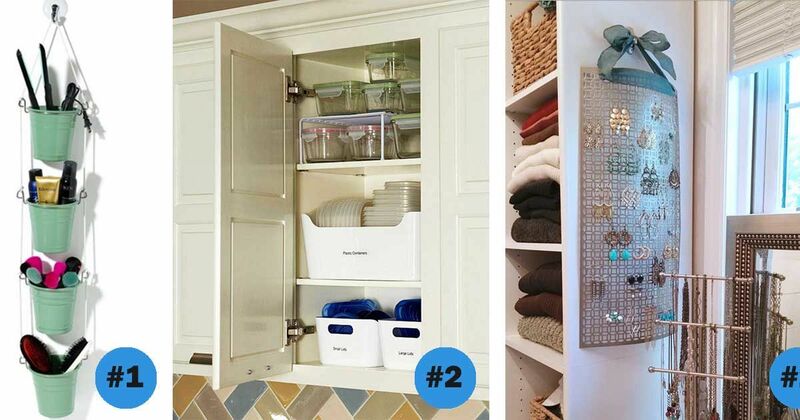 Below are 10 ideas to quickly organize easily cluttered spaces in your home with very little work. 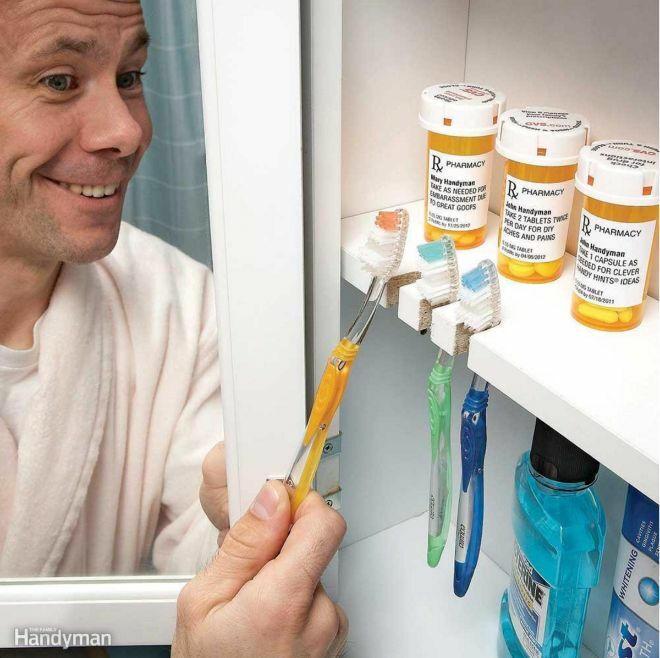 Rather than leaving toothbrushes on the counter in a holder, the Family Handyman hides his inside the medicine cabinet. All you need is a rotary tool with a woodcutting bit attached to cut the grooves in the shelf. Then, sand the grooves smooth. 2. Decorative mouthwash organizer, seen on Life as Mama. Rather than leaving unsightly mouthwash bottles on the bathroom sink, Life as Mama pours hers into oil dispensers for a prettier look. 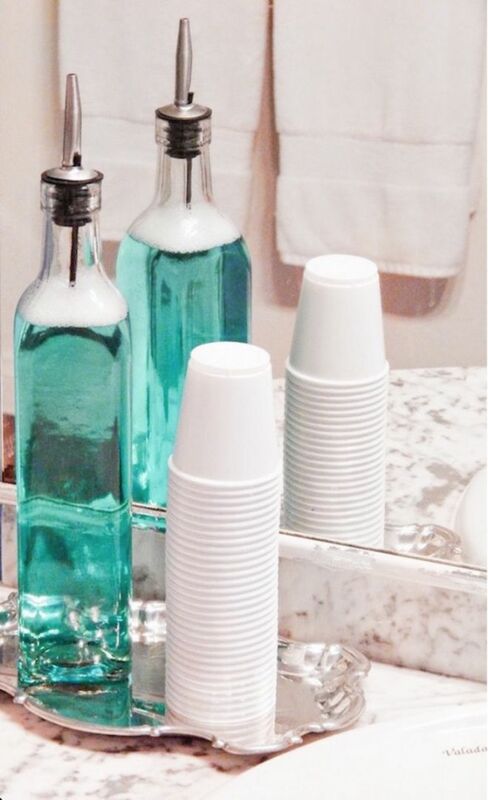 The mouthwash is still stored and accessible; it's just easier on the eyes. Available for purchase here for under $5. 3. Decorate and organize with a simple tray by Eat Sleep Decorate. 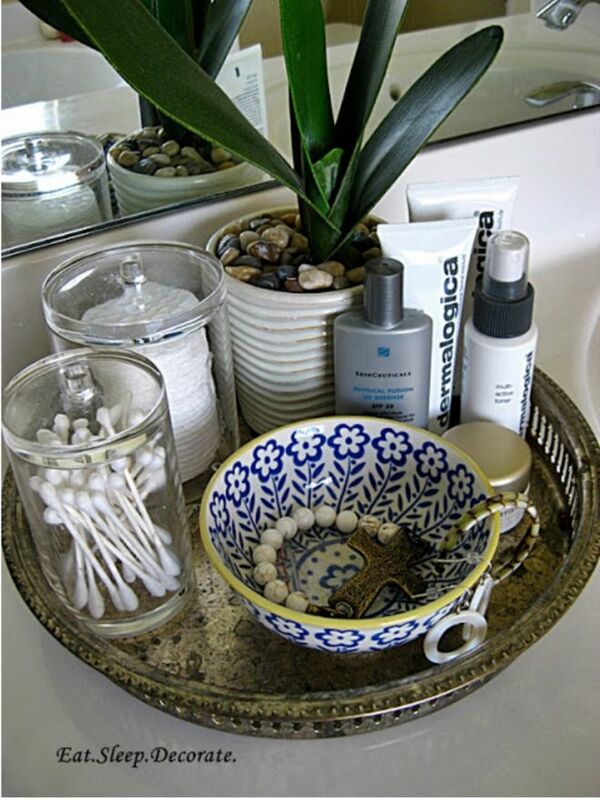 Most women have makeup and beauty products scattered on a counter or dresser. Eat Sleep Decorate takes a tray from a thrift store and quickly organizes all her beauty supplies on the tray. This keeps her work space clean and organized and even dresses up the space. Need a decorative tray? Buy this super cute one here. 4. 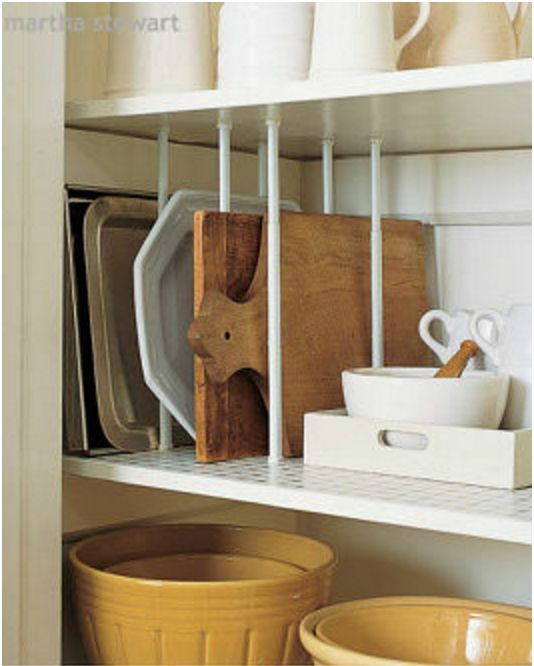 Baskets will organize your cabinets in seconds, by Better Homes and Gardens. 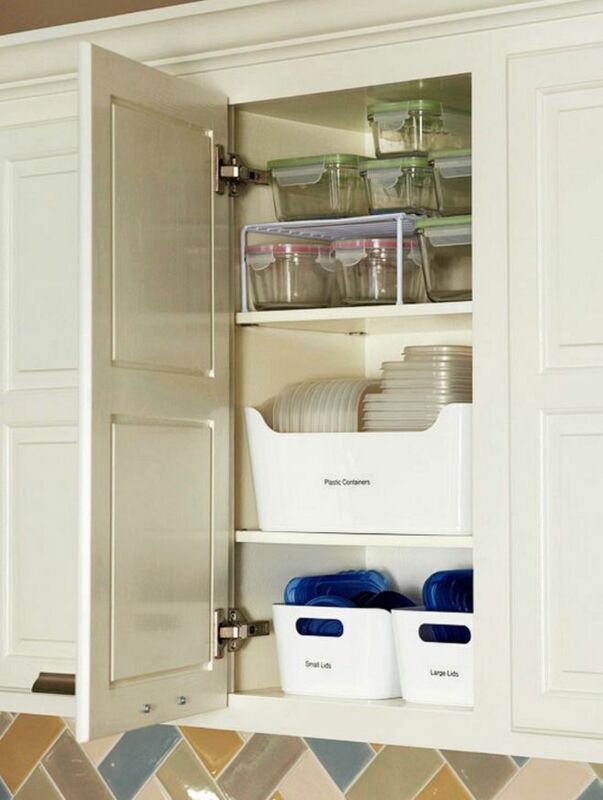 If you have any amount of storage containers, you know that keeping the lids organized can be really frustrating. Placing baskets for the lids in your cabinets and sorting your lids by sizes keeps the space clean and organized and your lids easy to find. Need a basket organizer? Buy a similar one here. 5. Earring holder by I Always Pick The Thimble. Most women can never have too many earrings. Having a place to hang all the earrings, though, can be a problem. I Always Pick the Thimble takes a 12-inch (30 cm) by 24-inch (61 cm) sheet of aluminum and gently bends it into an arc. She then feeds the ribbon through the top and ties a bow from which to hang the earring holder. The arc keeps the backs of the earrings from hitting the wall. You now have plenty of space for all your extra earrings. 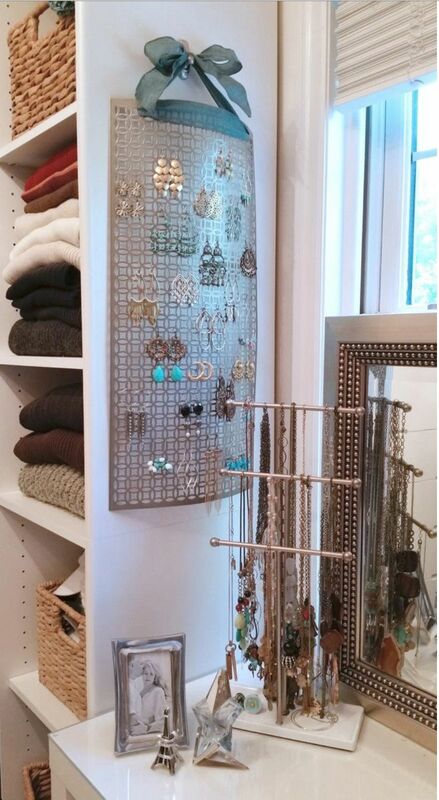 Need an earring holder? Purchase a similar one here. Need a necklace holder? By the one in the picture here. 6. Organize your freezer with clip binders as seen on Buzzfeed. 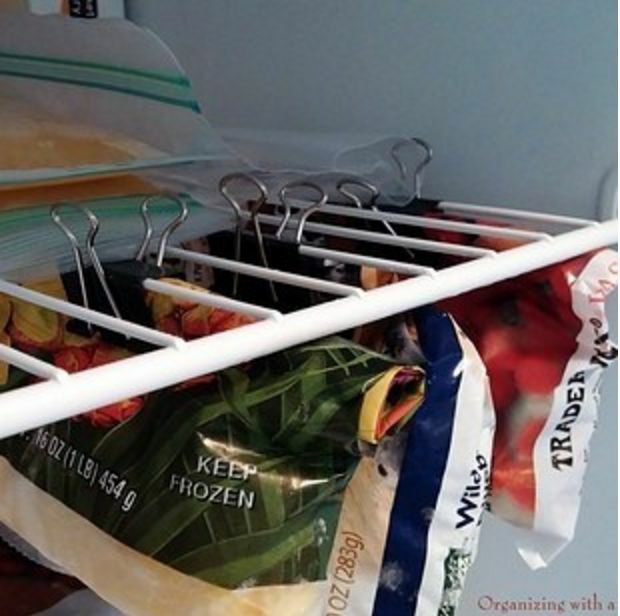 For those who use lots of frozen, bagged goods, this idea seen on Buzzfeed recommends using clip binders to hang the bags from the freezer shelf. This makes the frozen goods easier to find and frees up extra shelf space. 7. DIY Hanging organizer by Glamour. Hanging things on a door keeps stuff off the floor and countertops. Glamour creates a door caddy by hanging four Ikea cutlery caddies from an 8-foot (2 m) piece of clothesline. Find the center of the clothesline, drop down eight inches (20 cm) on each side of the center point and tie the caddy in place. Drop another eight inches and tie the next one. Continue to repeat until all the caddies are attached. 8. 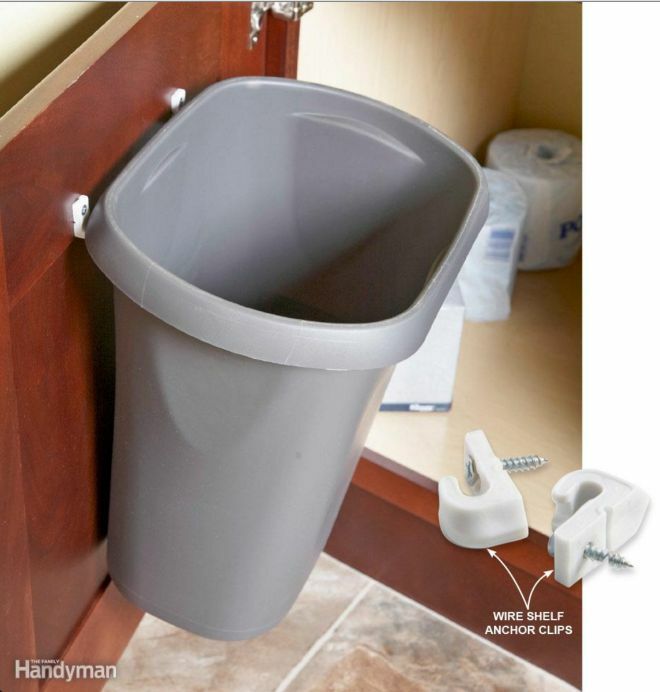 Hide and save space with a swinging wastebasket by Family Handyman. To attach the wastebasket to the cabinet door, simply attach two hooks to the inside of the cabinet door. Make sure your wastebasket has a lip on it. Drop the lip of the basket onto the hooks, and your basket will swing in and out of the cupboard easily. 9. Tension rod dividers, seen on Hometalk. To keep shelves neatly organized, use tension rods as dividers. You can then easily slide cutting boards and baking sheets in and out and keep your cupboard nice and neat. Similar one is here for purchase. 10. Organize your drawers with old shoe boxes, by Real Simple. Keeping underwear, socks and bras untangled and organized in a drawer is quite the challenge. Real Simple recommends taking old shoe boxes and cutting them to fit the size of the drawer. Simply fold your underwear and socks to the appropriate size and stack them in the boxes. Everything remains neat and untangled. Cleanliness and organization make concentration easier and living more enjoyable. These simple ideas keep your space neat and help you be more productive. Want a drawer organizer for your undergarments? Similar one here is available for purchase.